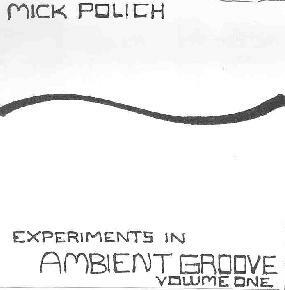 Mick Polich - "Experiments In Ambient Groove Volume One"
I've heard a few of Mick Polich's recordings and all have been quite different. The first couple were group efforts, but his solo album Wood And Electricity (see AI #20) was an interesting set of rock, jazz, and blues guitar pieces that showcased Polich's ability to explore the sounds that the guitar can produce to make standard musical styles fresher and more engaging. On Experiments In Ambient Groove, Polich does precisely what the title says, exploring and developing musical ideas that combine jazz with guitar soundscapes and heavy beat rhythms. In his accompanying letter Polich says, "I was thinking a cross between the Traffic soundtrack and mid-period Herbie Hancock/Headhunters, with the guitar taking the synth role". "Groovescape" opens the set and immediately shows us why he named the album Experiments In Ambient Groove. Polich lays down a head boppin funky groove with jazz guitar and cool Dub/Drum ‘n Bass downbeats which are where the Herbie Hancock influence shows. I haven't seen the movie Traffic yet, but I suspect "Warrior II" is where Mick's analogy to that soundtrack came from. Actually this reminds me of the soundtrack to The Limey (excellent Terence Stamp flick). We've got rapid fire techno beats against cool ambient soundscapes and steadily rolling basslines that support both the rhythm and the atmospherics. I really dig the combination of the carefully considered ambient guitar bits and spitfire electro beats. A nice marriage of contrasts. "Dreaming Backwards" is a similar but shorter track. "Number 6" features more tribal rhythms. And "Nine On Nine" consists of funky soulful jazz guitar and ambient washes against a cool bass and steady percussion. Polich returns somewhat to the territory explored on "Groovescape", but the ambient explorations are as front and center as they are on "Dreaming Backwards" and "Number 6". The track length displays as nearly 39 minutes but the music cuts out after 5, which is ok because these are all explorations, or "experiments" as the album title states. And with that in mind Polich has shared some interesting and enjoyable ideas that survey the ambient-groove landscape. I'd be interested in hearing him flesh out and firm up these ideas within a full band context. For more information you can email Mick Polich at: ac418432@earthlink.net. Contact via snail mail c/o Mick Polich; 10400 Grooms Bridge Road; Alpharetta, GA 30022.